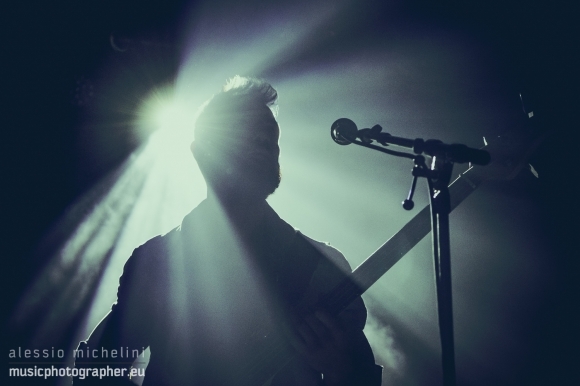 Musicphotographer.eu - Is the Fuji X-T1 a viable camera for music photographers? A couple of months I had to shoot the live show of Corner Boy for Red Bulletin Magazine, and because I could shot the entire show, I tried to bring my Fuji X-E1 alongside with my trusty Canon 6D, just to see how it behaves in such light conditions. While the AF was struggling sometimes and the white balance in some shots was completely off, a good amount of shots were pretty usable, even despite the kit lens, which is an excellent general purpose lens, but for not so much for gigs, or at least not for my standards, as I mostly shoot with only very fast prime lenses, no zoom lenses, and the slowest is the Canon EF 135mm f/2L USM . But despite a slow lens, and a camera not made for that type of photography it was pretty decent, still not usable for me, especially when you have only 3 songs, and that’s the 99.9% of gigs, and with a slow buffer and not that good AF it would make pretty impossible to use for a live show. So when the X-T1 came out, with better specs, faster AutoFocus, faster buffer, better viewfinder, and many other improvements over my old school X-E1, I wondered if this new camera could do the job. So I give it a try and I’ve asked to Fujifilm if they could borrow me an X-T1 to test it on the field and to see if this camera is a viable alternative to a DSLR. To be honest I didn’t hope to receive any answer, but surprise, they did answer, and they told me that they could lend me a camera for a couple of weeks. Before I start to tell you if this camera is good or not, let me clarify which characterstics a camera must have for a music photographer. While we might not need the tracking performances as our fellow sport photographers, simply because a musician doesn’t run as fast as a Formula 1 car, when I press the shutter button the camera must focus accurately, quickly and often in the pure darkness. I generally shoot at 1600, rarely I go under than this, if the gig is really dark sometimes I go above this settings, 3200 or in rare cases 6400, and what’s important for me is to have as less noise as possible, and possibly no banding or color noise. 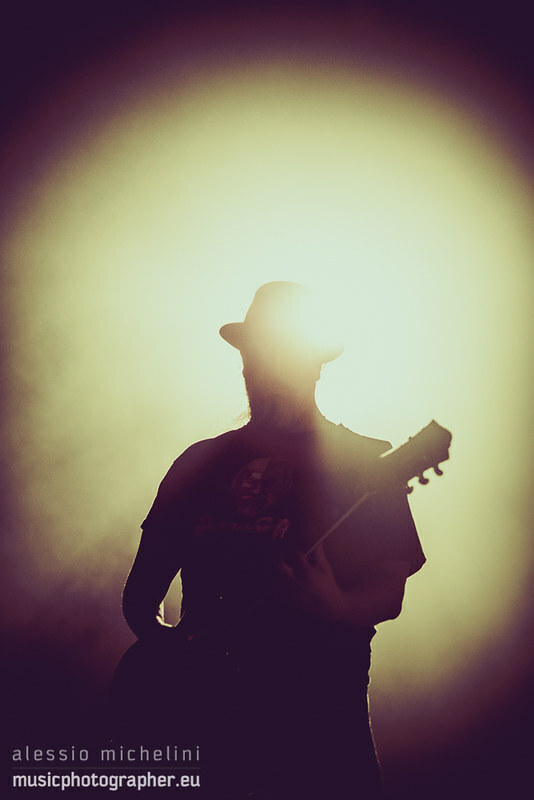 I often shoot rapid shots, sometimes even 10 frames for the same scene, in a couple of seconds, and while my average is way higher than most of my fellow music photographers, and sometimes I could shoot 700 or more photos in just 3 songs time, and the last thing I want is to see the LED of the buffering working and losing a good shot because the camera was busy saving previous photos. I shoot in manual mode, the only automatism I use is the AF, the rest, aperture, shutter speed and ISO is set manually, and I need to change these settings quickly during a show, so easy access to these functionalities is extremely important. So, now that we clarified what it’s essential for a music photographer, or at least for me, we can see how the Fuji X-T1 behaves. As you can see, while we have a nice silhouette (and that’s one of my favourite types of photos), apart from the edges of the subject we have no contrast, and bear in mind that this photos is processed and I recovered details of the face because I always shoot in RAW (and that’s one of the reasons why you should always shoot in this format), and the camera most of the times fails to focus just because it can’t hook to anything, and what I generally do is to focus on the edges like the hair/hears and then quickly recompose the shoot. You see, it’s not as simple as it looks, and if you don’t have a very good AF it’s gonna be very hard to obtain photos like this one. But the X-T1 is good enough? Well, I have to say that in some cases it failed, it just didn’t know where to focus, but throwing some stats, I would say that about a 5% of the times the focusing failed completely, then a 20% of the times struggled a little bit but at the end it was in focus or almost in focus, and the remaining 75% was in focus. It sounds a bit bad, but if you compare the same statistics with other DSLR, like my old 7D, just to be in the same sensor size family, and with a good AF, you get almost the same numbers. I have to add the fact that artists on stage move, a lot, and between the time you focus and the time you actually take the pictures, adding the fact that often you don’t get very fast shutter speed, the subject is out of focus. Also the X-T1, on that 75% of photos in focus, was extremely fast to focus, just a notch behind the DSRL I have/had, but while with the X-E1 the gap was huge, with the X-T1 it was very close, and if I were in Canon or Nikon, I would say “scary close”. At the end I can say, regarding the Autofocus, that the X-T1 is practically au-pair with most of the DSLR out on the market and in the same price range. As I said above, the High ISO performances are really, really important for a music photographer. You often shoot in the dark, especially in small venues where you just have a couple of crappy lights, and having a camera that can handle high ISO is essential. And for what I saw, the X-T1 is impressive, at the very least. Again I compare it with my old 7D, which it might be a bit old to some of you, but was the last crop sensor I had, and it’s still a really good camera, and modern DSLR with cropped sensors don’t really have any edge to the 7D. But the X-T1 in terms of High ISO, humiliates the 7D. But let’s stop a second. I have to remember that I had to test the Fuji X-T1 with the kit lens, which is a good lens in general, but way slow for me, and to compensate this lack of speed I had to set the ISO to 3200, which is twice as I generally have, and still it wasn’t ideal for me, but despite that, the noise at 3200 was incredibly good. There’s no band noise and no colour noise like the cropped sensors I tried in the past, actually it match the nice noise I get with my full frame Canon 6D, obviously the 6D is better simply because it’s a full frame, bigger pixel = less noise, but I was really well impressed with the performances of the X-T1. I can barely believe how good this camera is. I’m not saying that it has no noise, the noise is there, but it’s well controlled, and it looks beautiful to me. 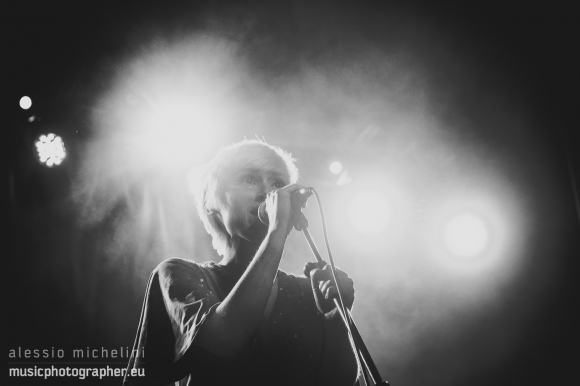 And if you flick through the photos of these two gigs (Ham Sandwich & Hermitage Green) I think you can barely recognise which photos were taken with the Canon 6D and the Fuji X-T1 without reading the Exif. So, even on this front, the X-T1 is totally capable to replace a DSLR, and actually, if compared to other crop sensors DSLR, it surpasses them. As I mentioned early, when I photograph a gig I take an insane amount of shots in a very short period of time, “3 songs no flash” is the rule, which is about 10-15 minutes (or 3 minutes in case of a punk band), and the very last thing I want to have is an unresponsive camera because the buffer is full and it has to write the photos on the memory card. You just risk to lose too many good shots only because of that problem. And with the X-E1 this was a problem, a big one. You take 3/4 rapid shots and the camera become unusable, yes you can keep shooting but you can’t review your pictures for example, which is pretty annoying. But with the X-T1 was a totally different story, it was fast, I could keep shooting as much I wanted, I never felt like I had to wait for anything. Even after a long sequence of photos the camera was always responsive, and you could always review the photos, it was as fast as all my DSLR, I really couldn’t tell any difference. So, even here, which was my main concern about this camera after my experience with the X-E1, all fine. That’s probably the only weak point I could find for this camera when compared with a DSLR. I know that everybody are loving these controls on top of the camera, and I’m not saying that I don’t like them, because I would be a lie, I love them when it comes to do some street photography, but while they are still a big improvement from the previous models, I still think that the combo I have on my Canon cameras (and I think on Nikon is pretty much the same), where I can control the aperture with my thumb and the shutter speed with my index finger, it’s still the fastest option to manually change your basic settings. Yes, you need to press a couple of buttons to set the ISO, but generally I don’t play much with ISO, I keep one ISO settings and I keep it for the entire gig. On the X-T1, while it’s pretty easy to change the aperture thanks to the aperture ring on the lens, it’s a bit problematic to change the shutter speed. It’s just not as accessible as on my DSLR, you are forced to remove the camera from your eye and then change the shutter speed. In theory you could do it while still have the eye on the viewfinder, but it’s not that easy for me, or at least not as fast I can get with my DSLR. With this camera, what you have to do, is to not change the shutter speed very often, and to play with the aperture ring to get the right exposure, it’s not a big deal a the end, and probably just for people like me where I always want to set everything manually, if you are shooting in Tv mode you will barely see as a problem. There are a few things that maybe are not as essential as the points illustrated above, but it’s worth to mention them. The viewfinder is amazing. I’m going to talk about it in another general review I’ll do about this camera, but let me tell you that the viewfinder of the X-T1 is the best I’ve seen so far on a mirror less system, it’s an entire world inside the camera. I also love the body of this camera, it feels solid, it has a good grip, better than my X-E1, and the fact is weather sealed contributes to give the impression to have a little tank on your hands, but at the same time keeping the camera lightweight, which is a big selling point for this camera, as too many times I had my neck sour because of the weight of my DSLR + lenses. There is another thing I want to say before my conclusion. I know that some of you would be concerned about the battery life of this camera, when you read 350 shots it might let you believe that you might end up with a dead battery at way before you have to leave the pit, but in real life it’s not a problem. Bear in mind that these numbers refers to a normal usage of the camera, where you take one picture, you reviewed it, and maybe you spend an entire afternoon taking pictures. That’s not the situation of a gig, as you use the camera for only 3 songs, and you take plenty of rapid fire shots, you use the viewfinder and the screen much less than normal conditions, that’s why with my Canon I can do 2000 photos and still have a good 60% of the battery, even if in theory the battery should last less than half of those shots, and it’s the same with the Fuji, on a gig you can take 700/800 photos and still plenty of energy left in the battery. Is it true than, if you use it for street photography and you spend the entire afternoon shooting around and you leave the viewfinder or the screen on for hours, it’s not gonna last long, but again, that’s not the situation of a live show. So we went through all the essential features a camera should have for a music photographer, and I was sincerely shocked how good this camera behaved in the pit, way better than I thought, and apart the controls which maybe are not the best, I’m pretty confident to affirm that the Fuji X-T1 is definitely a viable option for a music photographer, and while someone can point out that the price tag for this camera is higher than entry-level DSLR, it’s also true that this camera has insanely good ISO performances for a cropped sensor, possibly the best performance you can find, and if the weight and size of the camera is important, it’s definitely a good reason to choose this camera over a DSLR. And if you want to commit to the fuji system, and you want to invest a bit of money, I think the X-T1 with a couple of fast lenses, like the 23mm f/1.4 and the 35mm f/1.4 or maybe the combo 23mm + 56mm, is possibly one of the best option you can find for shooting gigs, or at least the small and average venue size, as unfortunately at the moment fuji lacks to any big tele lenses, which are needed in case of big venues, stadiums or festivals, but according to rumors websites Fuji might come out with a fast tele lens in the next few months. Fuji did an outstanding job on this camera, while the sensor is not that different from the previous generation, everything else a step, maybe a couple of steps forward. So for what concerns me, this is definitely a viable camera for music photographers, with no doubt.